Yippee! A blank slate! This photo is from the previous owners. We replaced the electric range with a black flat top. The room has no windows so we tried to make it as sunny as possible with golden yellow Venetian plaster. 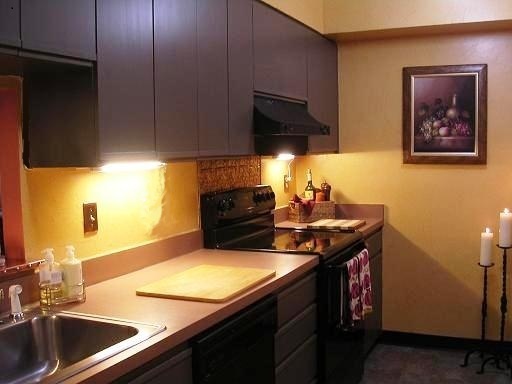 We also added under cabinet lighting which adds more light and ambiance. Keep scrolling to see counter top UPDATED! A wine rack over the copper counter transforms a breakfast counter. We coordinated stools with the living room furniture to ease the transition between the spaces. We now use this once dead space more than any other area. Clean up is sooo easy! I can now see the fire place and visit with guests when I’m cooking. 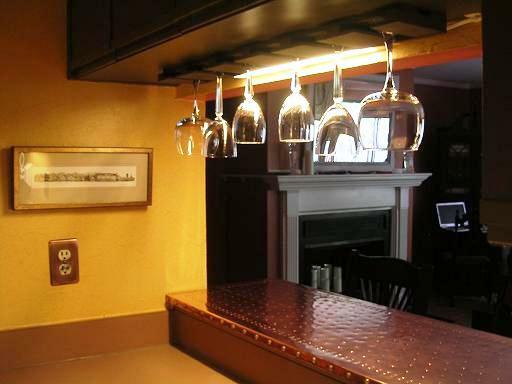 More micro wine glass racks serve to conceal the under cabinet lighting. This counter serves as a coffee bar every morning! We’d just updated the counters using PVC flooring over the laminate – keep scrolling for new pics! 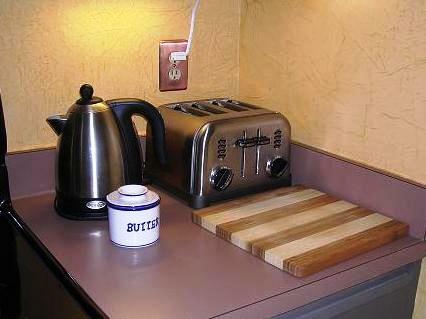 Tea and toast. A closer view of the Venetian plaster. It was messy but a whole lot of fun! Again keep scrolling to see how we recently UPDATED the counters using PVC flooring over the laminate! While we live in the “Halloween capital” of the US – no kitchen witches here! 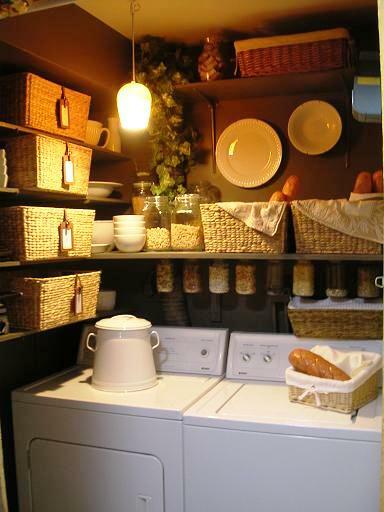 We used this picture as color inspiration to tie the kitchen living room and pantry together. 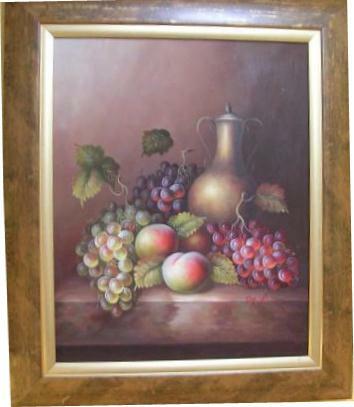 We’re going for a bountiful harvest feel in a very tiny space! The floor is laminate. We haven’t tackled it yet. The colors work so we can live with it for sure. Yet we’re also thinking of cork flooring. As the kitchen is seen from the hallway dining and living rooms we used the same rugs throughout. 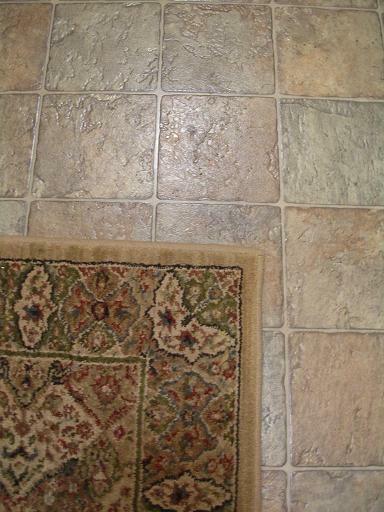 We wanted a distressed re-purposed wood look on our counters without the cost and found it with flooring! Close up of PVC flooring on the counter top. It’s really NOT wood! I never thought I’d be so in love with a faucet! Found it, along with a great black granite sink on e-bay for 1/3 of the price. 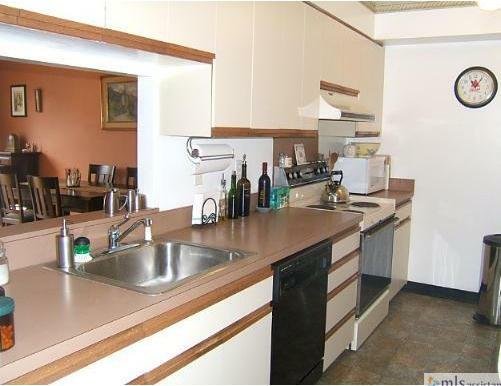 The old chrome faucet could be seen through the pass through into the living room and looked just awful. 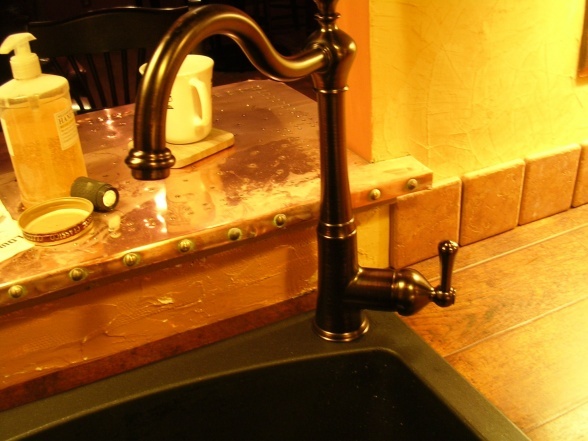 This blends with both areas and makes the copper counter look more like a small bar. 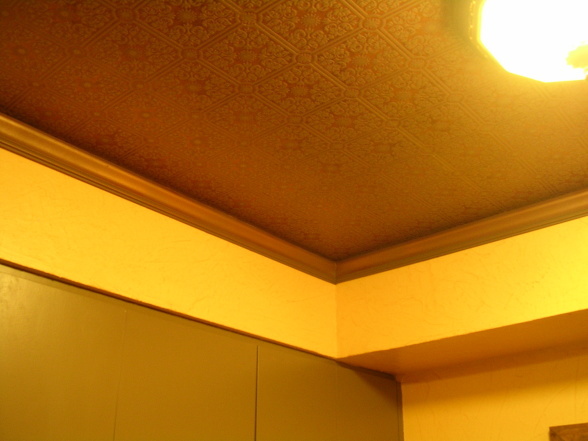 We added architectural wall paper, new lighting and molding to the ceiling for a more finished look. Our latest update includes new counters made from flooring and a new ceiling! We also added porcelain tiles to the opposite counter top for more heat resistance and tied in both sides with a small tile back splash with a few decorative tiles. MORE RECENT PICTURES TO COME! Love the idea of using flooring on the counters! Was it the vinyl “off the roll”? How did you stick it down? I’m very impressed at what you’ve done! Thanks for asking. 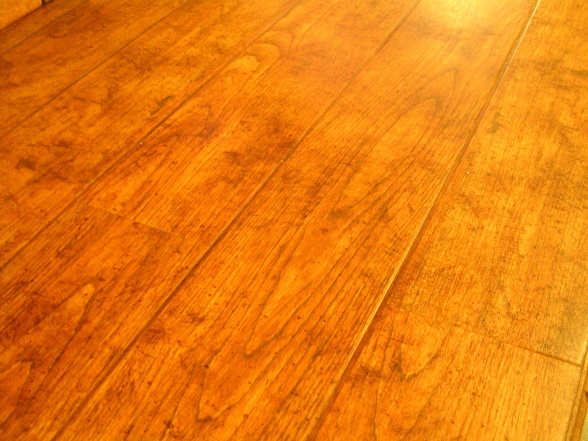 This is PVC flooring that comes in planks that you stagger when you lay each down like you wood with a real wood floor. It is about 1/16th of an inch thick and you paste it down with regualr flooring glue. I highly recomment using trivets to protect it though. 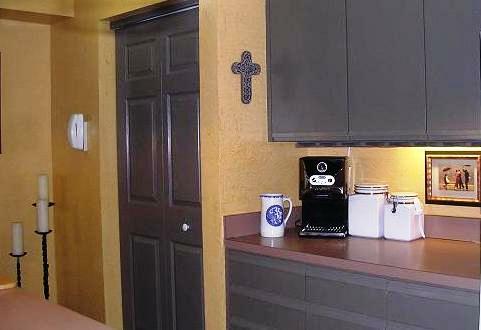 Did you have to use a special paint for technique on the laminate cabinets? The primer did the trick. Make sure you get a primer that will work on melamine cabinets. Then I just used 2 coats of satin finish. I to have to touch them up on occasion with a tiny paint brush, but rarely. Since these doors have a ridge at the bottom instead of a handle, I used a super high gloss of the same color on the ridge, since I knew it would get greasy and look shinny anyway. Very creative, warm and inviting. A true reflection of the owner’s talent and love.